Gentlemen – I recently acquired an aluminum flag stand made in 1924 for the Woman’s Relief Corps, organized as the Woman’s Auxiliary to the Grand Army of the Republic (GAR) in 1883. This ladies group is similar to the UDC, United Daughters of the Confederacy, in that it was intended to honor the dead of the Civil War, among other duties, by placing wreaths and flags on the graves of the honored dead from that conflict on a special day each year. Web sites note WRC was established July 25-26, 1883, in Denver, CO, and incorporated by Public Act of the 87th Congress on Sept. 7, 1962. The organization’s official purpose was stated as: “The purpose of the corporation shall be: To perpetuate the memory of the Grand Army of the Republic, as we the National Women’s Relief Corps are their auxiliary and were organized at their request in 1883, and of men who saved the Union in 1861 to 1865; to assist in every practicable way in the preservation and making available for research of documents and records pertaining to the Grand Army of the Republic and its members; to cooperate in doing honor to all those who have patriotically served our country in any war; to teach patriotism and the duties of citizenship, the true history of our country, and the love and honor of our flag; to oppose every tendency or movement that would weaken loyalty to, or make for the destruction or impairment of, our constitutional Union; and to inculcate and broadly sustain the American principles of representative government, of equal rights, and of impartial justice for all.” The WRC was officially incorporated Sept. 7, 1962, and it is assumed this statement was written at that time to include views and history from the time of the Civil War until then. 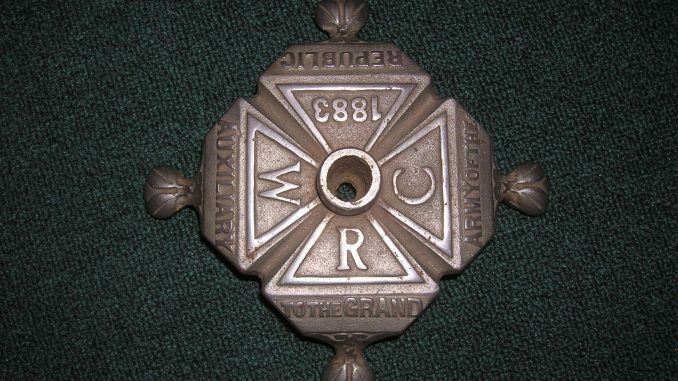 Note: In 1892 the WRC had 2,797 Corps Chapters across the United States, with 98,209 members. One activity they performed, with the assistance of children, was to make floral wreaths and place them alongside American Flags at the graves of Union Veterans and nurses who died during and since the Civil War on Memorial Day. This was written in 1962 by the Women of this group affiliated with the GAR – they state that the War was fought to preserve the Union, not strictly to free the slaves of North and South; remember this when you hear arguments about the reason the men of the North took up arms against the Southern States, and the core reason for the conflict.